The PhotoHunt challenge is engage and I’m about to engage TW in some serious paw to hand combat and she’s not gonna like it. Then again I didn’t like it when she misremembered the theme again. We had an entire blog written around the word expect when she went over to check the link. Good thing we did. Her senility and incontinence are getting worse and worse. What, Woman? Incompetent? You of all people are telling me I’m using the wrong word. HAH! I’m afaid I’m going to have to engage new staff to help me blog. All innerested parties can email writing and photography samples along with a doctor’s note proclaiming you are NOT senile. 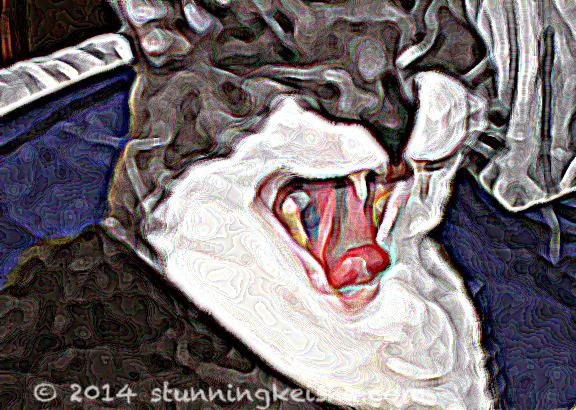 I’m also participating in the Caturday Art Blog Hop. In my art entry I’m engaging TW in some banter. I’m talking and she better be listening. BTW, you guys would have loved the post for expect. We LOVE the "pow"!!! That's the sort of love WE like to dish out, too...or so we think. I expect that I would have been very engaged by it. Well your engagement is certainly better than Waffles and his silly orange mouse. ...that boys got a lot to learn. You'll have to take matters into your own paws. LOL and we so love the pow CK. Have a super Saturday. I would like to apply for the soon to be vacated post of PA but can only accept if you can promise no paw pows. You certainly look mighty engaged to me CK! Senile! SeNile? CK, have you ever seen the Nile? TW will probably need some careful pawdling for the foreseeable!! MOL we've done the wrong thing a couple of times!! These themes have been really hard for cats to do. That is one powerful "pow" CK! Love the Arty you! What are we going to do with our humans CK. M has done so many goofy things this week, I can't even remember them all. We like your pictures too. My heart started to pound when I saw the title. *sigh* I got it wrong again. I thought it was different kind of "engaged" when I saw the title :-) Love the POW shot! And the art image is so cute! Have a great weekend! 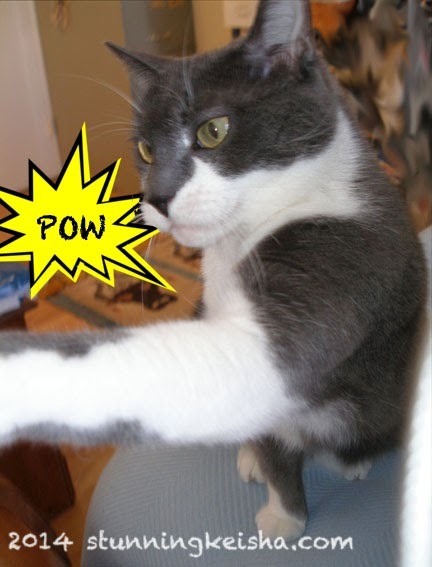 Darling, I know how much you enjoy keeping it real, so you were the fist kitteh I thought of when someone sent me this! Shoot--we don't see a warning--well, let me see if I can share it on my facebook page cause it's very funny! Comment from the cats: CK, if you get a lot of resume's, and you find a good assistant, will you please forward a few to us? Even they are bad. Our human gets more confused on a daily basis. Thank you. Poor CK.....I too have to suffer with an aged assistant who can barely remember MY name much less her own. Sigh. Tough to get good help! Are you sure you're not YAWNING at her boring drivel?? Did you notice my little pink tongue today? JUST for you, my sweet. Well, engaged is better than "expect to be incontinent," we suppose!